IRS Tax Deduction for Weight Loss Camp is allowed if your physician has diagnosed your obesity. You may take a tax deduction for weight loss camp if your physician has diagnosed your condition as obesity. Get that in writing from a physician if you plan on taking this deduction. A physician can provide you with a written recommendation for a tax deduction for weight loss camp. Without a physician’s diagnosis of the disease of obesity, you may not consider your expenses deductible. tax deduction for weight loss camp- what is excluded? The IRS is pretty specific as to how you can take a deduction and for whom you can take it. Can I deduct my gym membership and nutrition supplements? Although your doctor’s diagnosis can essentially authorize your tax deduction for weight loss camp, ordinary expenses are excluded. Can I take a tax deduction for weight loss camp for my obese teen? What about my obese spouse? 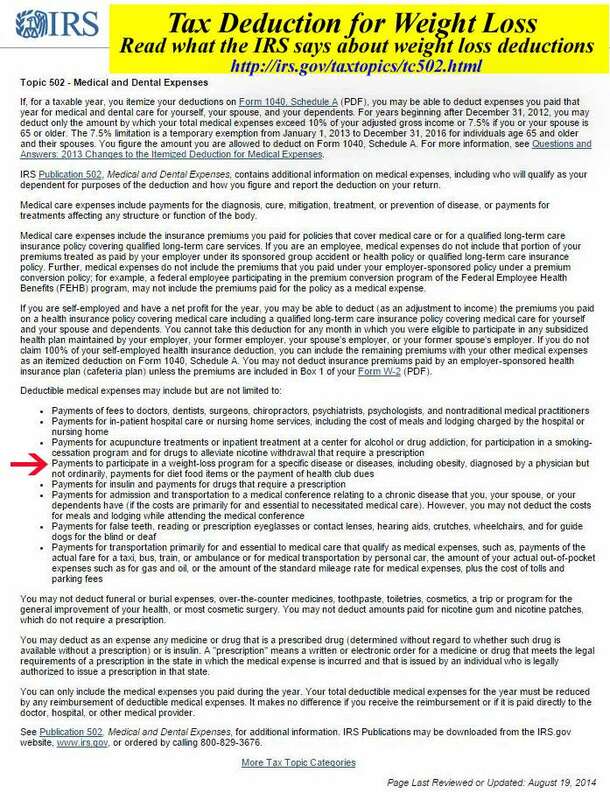 So, if a physician has diagnosed the disease as obesity and you include that member of your household on your tax return, you may claim a deduction. You may be missing out on a valuable deduction if you, your spouse, or a dependent has attended a weight loss camp after a doctor’s diagnosis of obesity. Exception for adopted child. If you are a U.S. citizen or national and your adopted child lived with you as a member of your household for 2013, that child does not have to be a U.S. citizen or national, or a resident of the United States, Canada, or Mexico. There you have it. Before you listen to anyone else, make sure you refer directly to the facts. However, the money you will save living a healthier life with reduced medical expenses can be exceeded by your increased productivity regardless of the tax deduction for weight loss camp. Click here for info on Insurance Coverage for Weight Loss .